Jane has her knight in training 'rescue the damsel' test. It is a difficult challenge that she must meet in order to carry on her apprenticeship as a knight. 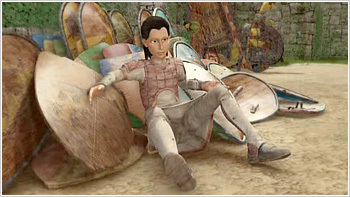 But the challenge becomes more so when Jane makes a pact with the King to protect her friend, Pepper. Jane must now complete the test successfully to stop the Prince raiding the kitchens and making Pepper's life impossible. But if she fails she has put her knighthood on the line — and must work in the kitchens herself. This is what the Prince wants, and what he wants, he is determined to get. 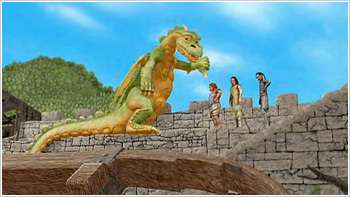 Dragon has a toothache and to the amazement of all falls for the tooth fairy story that Jane spins to get him to have his tooth pulled. But when Gunther steals his tooth so his father, the merchant, can sell the valuable item, Dragon discovers there is no tooth fairy at all. His pride is wounded and Jane must make up for the deception, make him feel better, and get him back believing in the story and her. 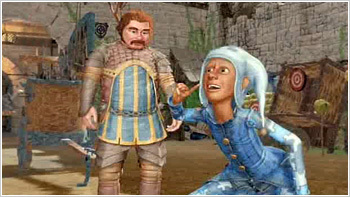 Jane's encouragement to Jester to do his impression of Sir Ivon leads to Ivon challenging Jester to a face-saving duel. Jane is mortified, Jester is terrified and Jane's efforts to save her friend from public doom seem, well, doomed. But Jester has discovered that he can choose weapons and he chooses wit. If only Jane could have had more faith in her friend's ability to stand up for himself. The annual Ball is here but Jane is suffering under Gunther's jibes that she just isn't good enough to be a real knight. Her determination to prove him wrong involves a decision to give up going to the Ball. Jane is disappointed, the Princess is hugely disappointed, but a flower thief is at work and Jane vows to capture him/her. Jane's friends provide a surprise substitute Ball for her. And Jane she catches the thief — Gunther, who has to admit she is a worthy knight. 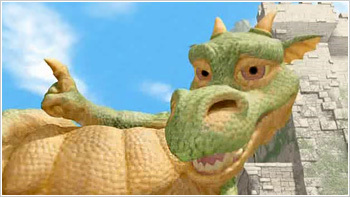 Dragon's clumsy playfulness has been causing a lot of problems in the castle and when he knocks a wall down it is the final straw. 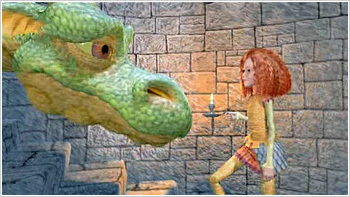 But Jane's rash defence of her friend has her inventing an offer to move to a castle where they love dragons. She is sure that her friends won't let them go — especially when they are made to realize just how useful and great Dragon is. But everyone thinks that this 'offer' is what Jane really wants and so, oh dear, she and Dragon's end up going through with leaving… only to return for Dragon to save Gunther and Jane to admit her little charade. Jester's favourite day of the year — All Fools Day — is here, when it is prank pulling ahoy. But the prank puller this time is Dragon; Terrible, unfunny pranks. Jane explains to Dragon what a real All Fools Day prank is — starting with funny. 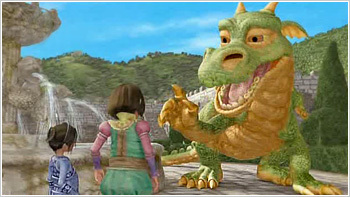 Jane is determined to pull a prank on Dragon but he is a hugely difficult target. The only way she will pull it off is to fool Dragon that he is in on a prank on her friends and then double bluff until the big fire-breather is well and truly got. 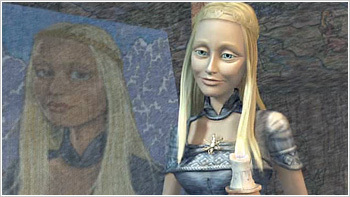 Jester is the King's hope for singing at the inter-kingdom competition of song. However, Jane's overenthusiastic voice coaching leads to Jester losing his voice. But when Jane hears a beautiful toned mystery crooner, hope is rekindled… and then dashed when auditions fail to find the singing source. Jane discovers the crooner is Dragon but he swears her to secrecy — singing is not acceptable dragon behaviour. 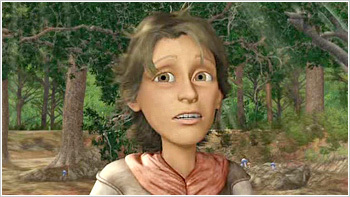 Jane is forced to pretend that she is the silver throated one but in truth her voice is awful. Her performance for the King lip-synching to Dragon's hidden talents is a disaster saved only by Dragon's stepping into the limelight. When the King and Queen are gone for the day on royal business, Jane is entrusted with "protecting the royal heirs," i.e. babysitting. Unfortunately, watching the bratty Prince and playful Princess wreaks havoc with Jane's plan to study for one of Sir Theodore's knighthood tests. 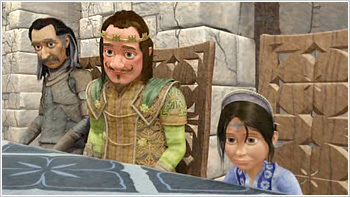 So Jane asks Dragon to keep an eye on the two children for an hour while she studies. The result: Dragon manages to misplace the Princess in a game of hide 'n' seek. 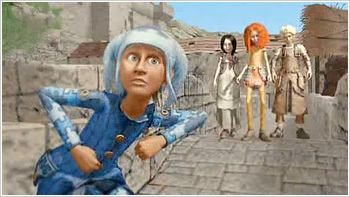 So Jane has to race to find the missing Princess before the King and Queen return home. 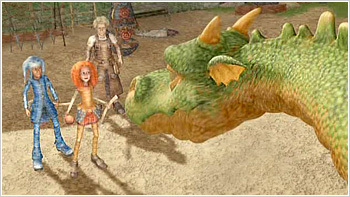 When Gunther pulls a practical joke on Jane, Dragon discovers he and Gunther share a similar sense of humour: lowbrow. Jane begins to feel left out, so she enlists Jester to give her a crash course on crass humour. But Jane still can't fit in with Gunther and Dragon and becomes jealous. Meanwhile, the Merchant urges Gunther to use his newfound friendship to trick Dragon into moving freight for them. 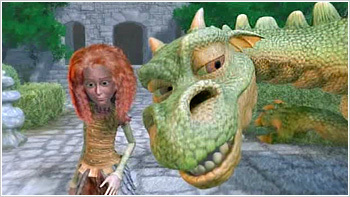 Jane discovers this scheme and tries to warn Dragon, who assumes that it's just her jealousy talking. But when Dragon realizes he is in fact being used, Jane has to talk him out of exacting his revenge against the Merchant and Gunther, dragon-style. 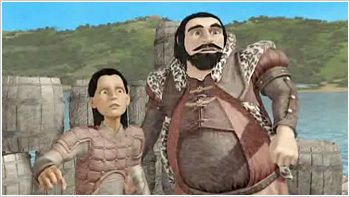 When Smithy's pig bites the Prince, the King decides that Pig must be tethered. Smithy is devastated — Pig is his pet and friend. When the King sells Pig to the merchant, Dragon decides to spirit his porcine friend to safety. Smithy takes the rap for Pig's jailbreak and is dismissed from the castle staff. 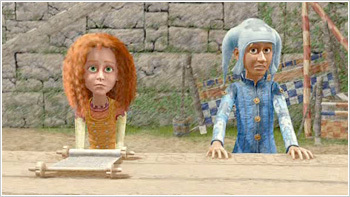 Jane finds out the truth as to why Pig bit the Prince. Now to solve this whole piggy problem, Jane must get the Prince on her side and make the King see that the problem doesn't lie with Pig, it lies with the way the Prince treats Pig. The King commissions a beautiful portrait of the Queen and Jane is entrusted to guard it before the grand unveiling gala. Meanwhile, Dragon is practicing a spectacular landing for the upcoming festivities when he crashes… causing Jane to leave her post momentarily to check on his well being. The next day when the Queen's portrait is unveiled the court is shocked to see her beautiful image has been defaced. Jane is to blame and saddled with extra chores as punishment. Undaunted, Jane sets out to discover the painting 'besmircher'. And is shocked to discover it is the Queen herself. More shocking yet, the Queen admits she's uncomfortable with her looks and can't stand the thought of her painting on display for the public. But when Jane is accused of being the portrait defacer the Queen steps forward to admit her guilt. With the three-hundredth anniversary of the castle approaching, Jane and Gunther are given an important chore to prepare for the Royal Jubilee. Whichever squire polishes more of the castle's myriad of shields will win the honour of carrying the castle banner in the Jubilee Parade. 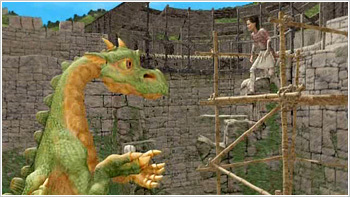 At the same time, Dragon wants Jane to come to his cave to help him decipher the carvings on his wall. Seeing everyone in the court so occupied sprucing up the castle makes Dragon wistful that he doesn't have a home. Just a hole in the ground. Meanwhile, the Merchant tries to insure Gunther's victory by sabotaging Jane's efforts to polish more shields. Jane prevails when Gunther nobly undoes his father's underhanded machinations. 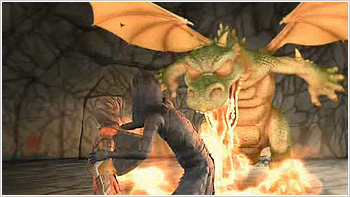 But in the process, Jane forgets her promise to Dragon to help him decipher his runes and offended, he flies off. Perhaps, forever! While out on patrol, Dragon's spontaneous loop de loop causes Jane to slip off and free-fall through the air. Dragon manages to save her in the nick of time, but is shaken by the experience. He vows that no harm will come to her and becomes like an overprotective parent. 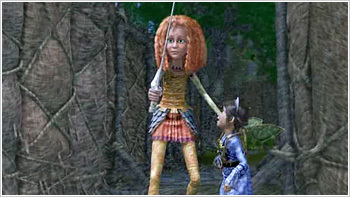 Jane rebels against his suffocating affection, and sneaks off on patrol alone on horseback with her cryptically carved hero sword. When a sudden storm spooks her horse, Jane finds herself stranded in the wilderness. As the storm intensifies, Dragon searches for her and discovers her only when Jane unlocks the mystery of runic sword, sending out a dragon summoning beacon. Dragon learns Jane can protect herself. When Jane eats some wild berries and passes out ill, she reawakens with amnesia. 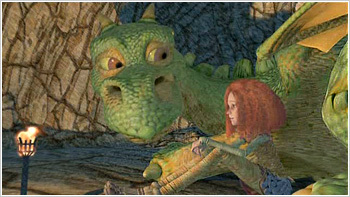 Jane now knows only one thing for certain; she is terrified of Dragon. Poor Dragon! Everyone must try to help Jane remember who she is, what she does and, most importantly, that Dragon is her best friend and knightly partner. For Dragon it couldn't be more serious; if his plan to help her remember him does not work then he will have to leave to find another dragon master. Jane must remember. She must. With Dragon as her spotter, Jane bests the team of Sir Ivon and Gunther in a catapult contest. But when the jealous Gunther discovers a weed that causes Dragon to sneeze, he uses it to level the playing field. Because when a dragon "Achoos!" flame is sure to follow. 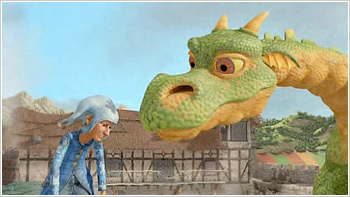 When the sneezy Dragon nearly starts a forest fire, the King insists Jane keep her flying lizard well away from the castle. Good enough for Gunther, but the Merchant sees an opportunity to get rid of his fire-breathing nemesis once and for all! He orders Gunther to catapult a cask of flaming tar into the peasants' fields and pins the blame on Dragon! When Jane finds herself trapped in the privy at night with no candle and a squeaky bat, she develops a sudden fear of the dark. To make matters worse, Sir Ivon and Sir Theodore have built a hedge maze outside the castle which Jane and Gunther must negotiate at night. Jane's friends try all sorts of cures, but nothing seems to alleviate her phobia. Then on the night of the hedge maze test, the Princess runs away — she's hidden herself in the maze in a misguided attempt to help Jane get over her fear. That's when a wolf pack is heard prowling the nearby countryside. 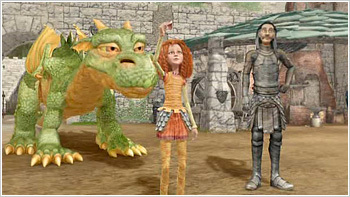 With Dragon's fiery help, Jane must brave the darkness to save the Princess. Like any typical father, the Chamberlain can't help but worry every time Jane goes out on patrol. 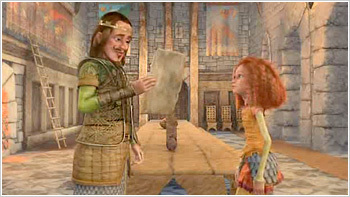 He'd much prefer his daughter help him take inventory of the castle supplies, but Jane finds her father's job boring beyond words. 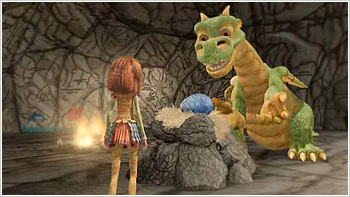 Meanwhile, Dragon's accidentally discovered a new underground chamber in his cave and wants Jane to explore it with him. When a cave-in traps them both there, it's the worry wart Chamberlain who notices something's amiss and sets off to rescue his daughter. And Dragon discovers that his late father cared for him, too, because of the etchings he'd left to warn his baby boy dragon about the traps and pit falls in the catacombs. When the Princess comes down with a cold, the King puts Jane in charge of cheering her up. Jane takes her assignment very seriously and arranges an array of fun activities that include: the Princess' favourite treat — strawberries; a ride in a cart pulled by Smithy's pig; and for the grand finale, a puppet show by Jester. Unfortunately, one by one, Jane's elaborate plans go awry. When Jester loses his confidence and the Prince eats all the strawberries, it's up to Jane and Dragon to try to save the Princess's day. 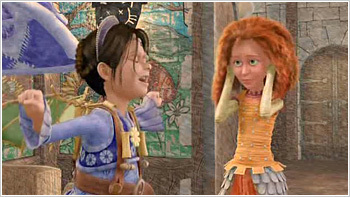 When Jane finds out that the King is bored with Pepper's cooking and that Rake has never travelled far beyond the castle, she figures that she can solve two problems with one Dragon flight. Jane gains permission from the King to set out with Rake on a mission to find new herbs to please the royal palate. But when Rake wanders off alone he gets lost and stuck in a log. 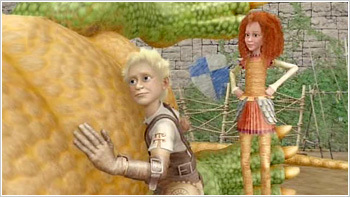 Jane and Dragon must now find herbs and rescue Rake. When Jane and Gunther get out of hand, Sir Theodore decides to settle their differences in the sparring arena. But when Pepper mistakes the two competitors tussling for hugging, she inadvertently starts a rumour that Jane and Gunther are sweethearts. When the gossip reaches Dragon, he only makes things worse by teasing Jane — who tries unsuccessfully to convince him and the rest of the court she doesn't like Gunther. The farce finally comes to a head at the squires' sparring match when both Gunther or Jane refuse to strike the first blow… until they both admit neither can stand the other. Let the fighting begin! The Merchant's new consignment of supplies contains an incredible object — a dragon's egg! Jane knows it is fake; Dragon has searched for 300 years and has never found even a scale from another dragon. Sir Ivon, however, is taken in by the scam and determines to buy the egg. But the egg goes to a surprise highest bidder — Dragon! Oh dear. When Jane finds proof that the egg is indeed phoney, her biggest problem is exacting a revenge on the Merchant that doesn't involve Dragon roasting him. When Sir Theodore assigns Jane the menial task of cleaning his sword, Gunther gloats over getting the easier task of Sentry duty. Dragon accuses Sir Theodore of playing favourites, but Jane defends her mentor… until she discovers a broken sword in Sir Theodore's quarters with mysterious runes on its hilt. When she asks Sir Theodore how he came to own a sword that looks like her hero sword, the elder knight is furious. He punishes her with more dirty work. Hurt and puzzled, and spurred on by Dragon, Jane comes to believe that Sir Theodore's sword may be that of a dragon slayer. When she spots the wizened knight riding off toward Dragon's cave, it's up to her to try to prevent her mentor and her best friend from a possible duel to the death. Jane tries to master her battle cry — to call out above the din of battle. Meanwhile, the Royal boar hunt is on and the squires are invited to join. Dragon cannot believe Jane will not stand up for the defenceless boar but Jane has no choice. So Dragon joins Jane on the hunt — they will go into battle together to outwit the Royal hunting party and protect the boar. 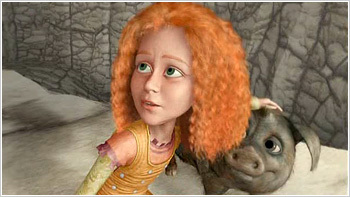 But when the boar threatens the Prince and Princess, it is Jane's battle cry that warns them. Dragon takes the boar away to safety. Battle won!